Chemistry is a branch of physical science that studies the composition, structure, properties and change of matter. Chemistry deals with such topics as the properties of individual atoms, how atoms form chemical bonds to create chemical compounds, the interactions of substances through inter-molecular forces that give matter its general properties, and the interactions between substances through chemical reactions to form different substances. This is a college preparatory course. Designed to develop chemical principles and concepts from experimental observations and data. These principles can be used to explain phenomena in daily life. Topics covered include atomic theory, chemical reactions, periodic behavior, kinetic theory, collegiate properties, organic chemistry and more. 50 % of the exam will be level 1 multiple choice questions. 20% of the exam will be level 2 or 3 multiple choice questions. 30% of the exam will be composed of level 2 or 3 free response style questions. ​​The free response will be composed of a performance task style problem where students are given a laboratory scenario and asked to draw conclusions through calculations and prose. Level 1 questions are used to identify what students know about a topic, they ask students to gathering and recalling information. Level 2 questions are used to assess students ability to process infomraiton, make connections, and create relationships. Leve 3 questions ask students to apply and/or evaluate information, to judge, predice, or hypothesize. 7.1 • How big is a mole? Make sure you add questions and a summary to your notes. Each element is composed of tiny indestructible particles called atoms. All atoms of a given element have the same mass and other properties that distinguish them from the atoms of other elements. Atoms combine in simple, whole-number ratios to form compounds. Most of the atom's mass and all of its positive charge are contained in a small core called the nucleus. Most of the volume of the atom is empty space through which the tiny, negatively charged electrons are dispersed. There are as many negatively charged electrons outside the nucleus as there are positively charged particles (protons) inside the nucleus, so that the atom is electrically neutral. HS-PS1-2. Construct and revise an explanation for the outcome of a simple chemical reaction based on the outermost electron states of atoms, trends in the periodic table, and knowledge of the patterns of chemical properties. HS-PS1-4. Develop a model to illustrate that the release or absorption of energy from a chemical reaction system depends upon the changes in total bond energy. HS-PS1-5. 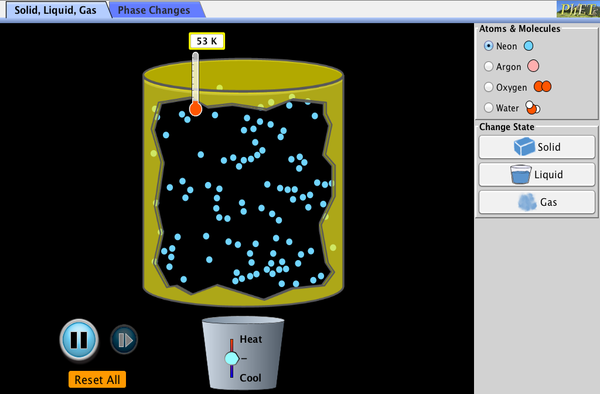 Apply scientific principles and evidence to provide an explanation about the effects of changing the temperature or concentration of the reacting particles on the rate at which a reaction occurs. HS-PS1-6. Refine the design of a chemical system by specifying a change in conditions that would produce increased amounts of products at equilibrium. HS-PS1-7. Use mathematical representations to support the claim that atoms, and therefore mass, are conserved during a chemical reaction. HS-PS2-4. Use mathematical representations of Newton’s Law of Gravitation and Coulomb’s Law to describe and predict the gravitational and electrostatic forces between objects. HS-PS3-1. Create a computational model to calculate the change in the energy of one component in a system when the change in energy of the other component(s) and energy flows in and out of the system are known. HS-PS3-2. Develop and use models to illustrate that energy at the macroscopic scale can be accounted for as a combination of energy associated with the motions of particles (objects) and energy associated with the relative positions of particles (objects). HS-PS3-4. Plan and conduct an investigation to provide evidence that the transfer of thermal energy when two components of different temperature are combined within a closed system results in a more uniform energy distribution among the components in the system (second law of thermodynamics).